A new study looks at recent droughts across the Mediterranean in the context of the past 900 years. The charts highlight dry years (brown) and wet years (blue) in three regions showing regional average scPDSI time series. The map, from the Old World Drought Atlas, shows the multi-year average scPDSI for 1980-2012. From Cook, et al., 2016. The study, published in the Journal of Geophysical Research: Atmospheres, is the first to quantitatively evaluate droughts across the Mediterranean region during the past 900 years at a high level of detail. It doesn’t identify a cause of the recent Syrian drought, but it does provide independent support for studies that have suggested global warming may already be having an effect there, said lead author Benjamin Cook, a climate scientist at Columbia University’s Lamont-Doherty Earth Observatory and NASA Goddard Institute for Space Studies. Cook and his colleagues are among the first scientists to analyze data from the 2015 Old World Drought Atlas, which maps dryness and wetness year-by-year across the Mediterranean over the past millennium based on tree ring records. The results provide new insight into climate patterns that can help scientists develop better drought risk assessments and improve understanding both of the bounds of natural climate variability and what may be the emerging influence of greenhouse gases. Climate models suggest that the Levant is likely to grow drier as global temperatures rise. Some studies suggest that may already be happening. A 2015 study that linked the recent Syrian drought to the start of the civil war there determined that increasing levels of greenhouse gases from human activities like the burning of fossil fuels had likely increased the probability of such a severe and persistent drought in the region, making it two to three times more likely. “After the release of the Old World Drought Atlas last year, we have been eagerly awaiting research like this that places recent droughts in the context of variability over the past millennium, far longer than the century or so that can be analyzed with weather station records,” said Richard Seager, a climate scientist at Lamont and co-author of the 2015 Syria drought study. “Cook and colleagues’ result is consistent with human-driven climate change and drying of the Middle East having contributed to the severity of the drought. This also raises confidence in climate models that indicate the eastern Mediterranean will be a hot spot of aridification due to rising greenhouse gases and that this change is already underway,” Seager said. Across the Mediterranean, the new study shows some basic patterns. 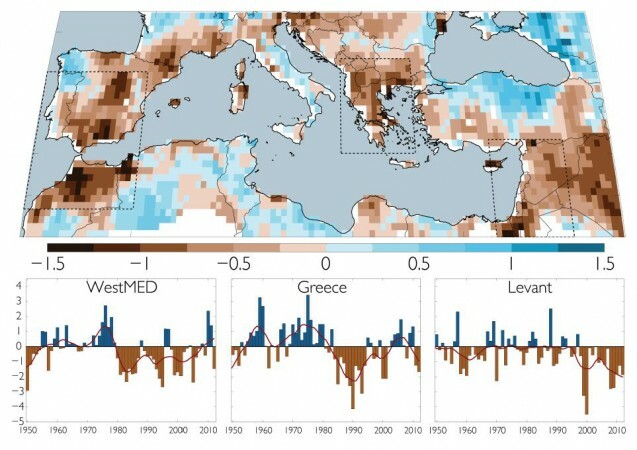 Large droughts tend to affect both the west end of the Mediterranean and the east end at the same time. North and South tend to be the opposite: When Turkey and the Anatolian region are wetter than normal, coastal Libya, Egypt and the Levant tend to be drier than normal. The study highlights several periods of persistent drought across the entire Mediterranean region during the Medieval period, including in the 1100s, 1200s and 1300s, but the scientists found no evidence of megadroughts of more than 30 years as studies have shown in North America during that time. Some unusual patterns also appear that provide fodder for future research. For example, a nearly two-decade period of excessive rain from 1125 to 1142 in what today would be Spain, Morocco, Algeria, Tunisia, Italy, the Balkans and Turkey occurred at the same time as extended drought across much of North America. That suggests that there could have been a large-scale shift in atmospheric circulation across the Atlantic, possibly related to sea surface temperatures, the authors write. This new ability to see how periods of drought and extreme wetness play out across the Mediterranean basin over a millennium can help provide better evaluations of climate model simulations, Cook said. Climate model simulation, in turn, may tell scientists more about the dynamics and the drivers of different drought events. “Even if you don’t care about climate change, our instrumental records are pretty short, so our understanding of natural variability is pretty limited by the last 100 years of data. These longer paleo records allow us to better characterize natural variability to really better understand, for example, how often droughts of a certain magnitude would happen even without climate change,” Cook said. The Old World Drought Atlas was created from the analysis of thousands of tree ring samples collected into local chronologies. In the Levant, tree ring scientists have been able to date existing forests and timber beams and cedar flooring in ancient buildings going back to the 1300s. Older chronologies from within a 1,000 kilometer radius help to fill in details for the region going farther back in time. Cook’s co-authors on the new study are Kevin Anchukaitis, Ramzi Toucahn and David Meko of the University of Arizona, and Edward Cook, a research professor at Lamont and co-founder of the Lamont Tree Ring Lab.